Why do coaches have to keep screaming this message? The answer seems easy. Basketball players love to shoot. In other words, many players have trouble resisting their inner ball hog. Consequently, coaches have to scream a lot. Academic meetings typically involve less screaming, but the behavior we see in these meetings is surprisingly similar to what we see on a basketball court. For example, recently I attended a meeting at Southern Utah University. The meeting began at 4 pm, and 25 minutes later we still hadn’t started on the items that were the actual subject of this gathering. Instead, numerous people had chimed in on items we supposedly had finished in our previous meeting (and other issues not related to the subject at hand). On the surface, ball hogs and endless meetings might seem unrelated. Research, though, indicates that players chucking shots at a basket and people prolonging a meeting with endless comments may actually be a function of something similar. Specifically, how do we know someone is “competent”? To see this, let’s first talk about meetings. A few days ago Stephen Dubner indicated that he “dislikes meetings in general,” And he proposed that it would be better if we all stood up during meetings. Although I am sure this could help, maybe it would be better if we understood a root cause of endless meetings. “Dominant individuals behaved in ways that made them appear competent,” the researchers write, “above and beyond their actual competence.” Troublingly, group members seemed only too willing to follow these underqualified bosses. An overwhelming 94% of the time, the teams used the first answer anyone shouted out — often giving only perfunctory consideration to others that were offered. Think about what this study says about meetings. If I want you to think I am competent, I need to talk. But if all of us have this same incentive… well, maybe we better be standing. A sit-down meeting can be endless (or at least seem that way). Okay, what does this have to do with basketball? Consider the case of Carmelo Anthony. 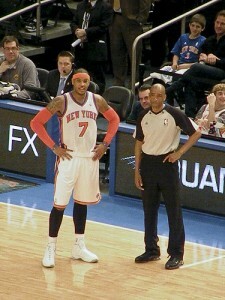 For many people, Anthony is obviously the New York Knicks best player. He is the highest paid player on the team. And he leads the team in scoring. But with Melo in the lineup this season, the Knicks are only 10-12. And since Melo was injured on February 6, the Knicks have yet to lose. That suggests that maybe Melo isn’t quite as good as people think (a suggestion that someone dared to make before Anthony came to New York). Questioning the value of Carmelo Anthony seems to fly in the face of the numbers, or at least a number. Across his career, Anthony has averaged nearly 25 points per game. And for many fans, members of the media, and decision-makers in the NBA, that one number – points scored – captures much about a player’s value. Published academic research for decades has indicated that scoring dominates the evaluation of basketball players by observers both within and outside the industry. Given the dominance of scoring, players who want to be considered “stars” have a clear incentive. To be a star you need to take as many shots as you can get away with. Again, consider the case of Mr. Anthony. Throughout his career he has never failed to lead his team in field goal attempts per minute. But when we consider his “true shooting percentage” – or a measure of shooting efficiency that considers efficiency from two-point range, three-point range, and the free throw line – Anthony has only finished among the top five on his team twice (he was 5th on the Denver Nuggets in 2007-08 and 3rd on the Nuggets in 2005-06). Thus far this season, Melo ranks 10th – out of 14 players on the Knicks – in true shooting percentage. So Melo isn’t a great scorer because he really is a great scorer. His status as a scorer is really driven by his willingness to “take” shots. Of course, some might argue that Anthony’s value is his amazing ability to “create” shots. But a better word is “taking” shots, as in “Anthony takes shots from his teammates”. When Melo isn’t in the line-up, his teammates – in either Denver or New York – have no trouble finding someone else to “take” shots. In fact – as we reported in Stumbling on Wins – most of an NBA player’s shots are simply taken from his teammates. Because players are evaluated in terms of scoring, though, NBA players have every incentive to “take” as many shots as possible. Consequently, a basketball game isn’t just a competition between two teams. It is also a competition between players on each team to take as many shots from their respective teammates. Of course, focusing on your own shot may not be in the best interest of the team. So that means coaches have to constantly remind their players keep passing the damn ball! With respect to evaluating people in meetings and evaluating players on the basketball court we see a disconnect between actual competence and perceived competence. And that disconnect creates problems. The obvious solution is to simply stop evaluating people incorrectly. In other words, these problems could be solved if we understood that scoring inefficiently in basketball doesn’t help a team win and just talking at meetings doesn’t mean you are competent. ly learn to look past scoring totals, perhaps the incentives of players can be changed and coaches can find something else to scream about. But solving the problem of endless meetings seems a bit harder. People might get a bit upset if we started evaluating each comment to see if it actually indicated “competency” or if it just indicative of “pseudo-competency”. In fact, if we had such a system people might be reluctant to speak at all. Wait, maybe that would be okay. If people were reluctant to talk maybe meetings would go much faster. And then we could all stand-up and just leave! A really good way to avoid this kind of inefficient signalling behavior in meetings is to declare Crocker's rules, which basically says: people don't have to be nice to you if they think you're wrong. (http://www.sl4.org/crocker.html) So if someone is hogging the stage without adding to the discussion, we can just shut him (rarely 'her' :D) up. Of course it goes both ways and you can be shut up too. This doesn't solve the problem completely, and if not implemented properly, it can go sour. But it might help in some cases, like academia, where the stated goal of everybody is get to the truth of some important problem. Hard to see a similar strategy for basketball. You can't just grab the ball from your teammate's hand. I fail to understand why someone would include a sexist remark in a comment about basketball and meetings. What's more, sexist remarks in which the male bears the brunt of the statement are rarely challenged. The fact of the matter is that Sid offers no empirical evidence that men "hog the stage" more than women. What I would like to see is some reference to a series of studies in which subjects were analyzed based on gender and capacity to "hog the stage". And I would need to see studies from a broad range of cultures. Because in my experience, living in the supposedly "gender neutral" country of Sweden, women can "hog the stage" just as readily as men. It is called a "joke" Stim. Possibly with purposefully contrarian undertones. I realize that emotion and tone doesn't necessarily translate well in things like comments, but Sid's statement seemed blatantly clear to me. Many years ago, I took a course on meeting facilitation from Jim Rough, who had what I thought was kind of a unique approach. The basic idea was that the reason people keep talking in meetings is that they have some point that they want to make, and that they are basically unable to hear anybody else until they feel that they themselves have been heard. His solution, then, was for the facilitator to make sure comments were acknowledged by recording them publicly on charts taped to the walls (as I say, this was a while ago), and direct them by the kind of comments towards solutions. When I've used this technique, it's been very effective, making meetings productive and worthwhile. But it's not always easy to persuade people to use it, since it is different. I'm surprised to hear you refer to this model as "different". I cannot tell you how many facilitated meetings that I have attended (1) where people talk, (2) it gets written on a chart, (3) at the end, someone reads back what is on the chart, (4) we all pat ourselves on the back and go home, and (5) a few weeks/months later, we repeat this process until funding runs out. 1) My seven-year-old son, playing on a YMCA team, almost immediately passes the ball--usually to the consternation of his mother and me--while his teammates will take a ball from one end of the court to the other, letting go of the ball only to take a shot. I like to think it is because my son is selfless, not that he is unwilling to take the risk. But the other guys REALLY ARE ball hogs. I'm going to go with the whole notion that my son is somehow morally superior to them all (SMILE). 2) I wonder if "being heard" is a driver behind terrorism. I am convinced that it is. That is, the violence that the foist, analogous in some way to someone prolonging a meeting, is because they "need" to be recognized in some way. I came to this conclusion some time back when, after saying something repeatedly, I felt I was being ignored, made to be almost invisible. I was stunned by the rage I felt. I mean, I was ready to rip limbs off of people for their rudeness! It occurred to me that terrorists are trying to be heard. When they are not invited to the table, when they are told they must first jump through a thousand little hoops before they can sit down, or they feel steamrolled, they are going to become outraged at some point. Coupled with their worldview (and perhaps their religion), they are willing to kill even the innocent. I have to tell you that I think it may be a mistake to NOT talk to "terrorists" (which a lot of groups get labeled as without just cause, it seems). By just talking to them, letting them know that they are being fairly heard, I think we take the wind out of their sails. In my own case, I did not have to have my way to feel some degree of satisfaction; I simply had to be HEARD. I think meetings and basketball players--and maybe terrorists--are all trying to be recognized/heard...and when they don't think they're being heard, they do things to make sure we do hear them. There may be something in this: certainly the closest I've ever come to justifiable homicide in academic/professional circumstances is when dealing with individuals who let others get in about half a sentence, then start speaking over them. It occurs to me, and maybe it has already to others, that it might be good for a coach to keep track of who has gotten the fewest shots, and then tell his players to pass to that person, who is to take more shots--players who don't comply get fewer minutes--there might be an interesting stat in there--a measurement of a person's ability to assist the player who has taken the fewest shots yet in the game, or a stat about a player's ability to pass to the lowest shot-taker on a squad. It's crude, obviously, but interesting. I wouldn't say that the coaches don't have some kind of a system for making that happen though. I would say that chuck daily probably did. Toastmasters has a course that is great at teaching you how to run a meeting. It can be summed up by first, gathering whatever points the attendees say they want to discuss. Second, write an agenda giving those people a reasonable amount of time to cover their points. Third, stick to the agenda and the clock. If you offer someone 5 minutes to speak and they spend the first 4 talking about something not on the agenda, well, they blew their time. Tell them they can add it back in to the next meeting. You'll only have to do this once or twice before they get the point. If a tangential item comes up, put it on a whiteboard and promise to come back to it if time permits or to add it to the next meeting. Above all, keep to the clock. People quickly understand that they must be concise and make the most of the time they are given. Can someone tell me why basketball doesn't use a +/- statistic like ice hockey? In hockey it is messed up by who plays on power plays, but in basketball it would seem to be a really meaningful stat. Norm, there are several variations of the +/- stat floating around for basketball. In every box score at espn.com they show the +/- for each player for that game. There are also several different metrics that use some form of "Adjusted" +/- and take into account the other players on the floor (both teammates and opponents). The problem with these metrics is that they are very noisy, and vary significantly from year to year. They have very little predictive ability, and since they can vary so much from year to year it's hard to even gauge how accurately they are reporting what they claim they are. True. But are they less noisy or less meaningful than points scored by that individual? If so why? Seems to me that points scored (total or per minute played) still depends on who is on the floor, whether it is the last few minutes, etc. I made this same observation during an all star match with Michael Jordan on the losing team. He scored over 40 points, but somehow his team still lost. Though I know his % is fantastic, on the all star team it doesn't seem like he should have made such a high score. I can't help think that the other team beat his because they new exactly where the ball was going to be. another possible contributing factor is that while pro-sports players and academics face genuine competition at the tops of their respective fields, they spent their formative years in smaller ponds where they grew accustomed to being the most athletically capable/intelligent person around (and in which taking the lead might be a much more reasonable approach).